A weekly newspaper editor has paid tribute after his chief reporter died suddenly at the age of 42. Steve Mitchell, left, had worked in the role for the Brechin Advertiser for the last four years, following a previous spell working for the paper which he joined after completing a journalism course. In between, he worked in PR for Aberdeen City Council and the job centre in Dundee and he was also heavily involved with Brechin City Football Club, including being a former director of the club. Steve collapsed and died at his home in the city on Sunday morning and the cause of his death was still being established. Editor Alan Ducat said: “We have all been left stunned by this devastating news. 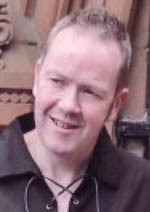 “Steve’s untimely death has robbed the local community of a man who knew Brechin and its people inside out. “He was the old fashioned reporter – the one that would get out and about, meet the people and get the story. Alan added Steve had been diagnosed with diabetes at the age of two and was at the forefront of a campaign to save Stracathro Hospital from the axe. He added: “His passion for football and his beloved Brechin City knew no bounds and, in recent weeks, he was literally willing them into the Scottish first division. “From the text messages I received on Saturday afternoon, he was thrilled to bits that Brechin had reached the final of the promotion play-offs after condemning Cowdenbeath to the second division. Steve leaves his second wife Kymm, four daughters Lauren, Ashley, Carly and Ellie, two step-children Glen and Charlie, his father and his brothers Andy and Doug.